The weird ruffled shape comes from what, as you’re knitting, feels like completely incomprehensibly placed increases and decreases. Then the folding happens. Magically you have something that looks like a sweater. The seaming didn’t take long at all. The seams are sewn from the neck to the end of the sleeve on the top of the shoulders. Buttons took me a little longer. 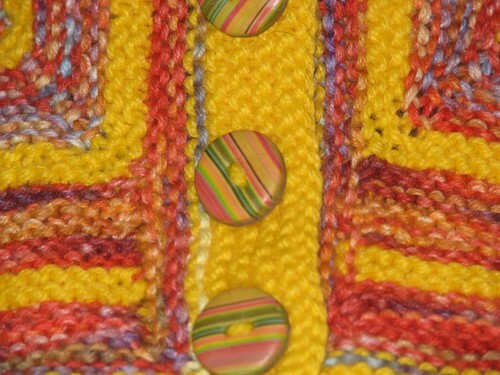 I ordered some great polymer clay buttons from Orly Rabinowitz on etsy. The buttons took a while to get here since Orly is in Israel, but they’re so cute and work so well that it was totally worth the wait. Also, I got to procrastinate on finishing without feeling guilty. The variegated yarn comes from a Knit Picks Sock Blank that was dyed for me by schknitz on Ravelry for a swap. I used two strands together, so it was basically a worsted weight. The contrasting yellow was added as an afterthought when I did the math a realized that I was certainly going to run out of the main color. 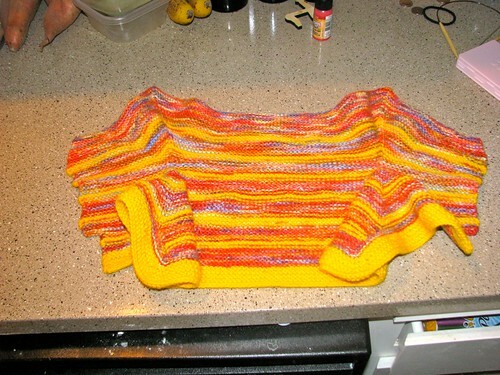 It’s leftover Encore Worsted from way back when I knit a baby sweater for a boss who is a huge Green Bay Packers fan. 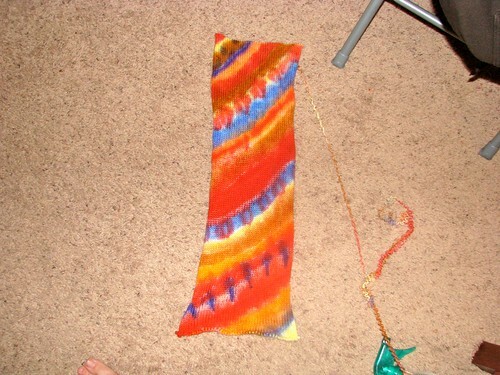 Here is what the Sock Blank looked like before it was knit. 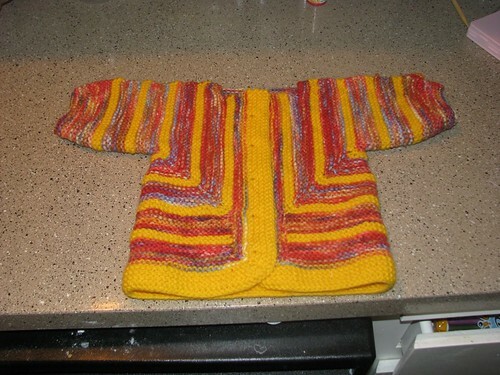 Now that it’s done I have no idea what to do with it… I don’t have a baby. I don’t know anyone who has a baby. I don’t know anyone who is in the process of making a baby. I think I might donate it to one of the charities to support the homeless in Portland. It’s starting to get pretty cold here. 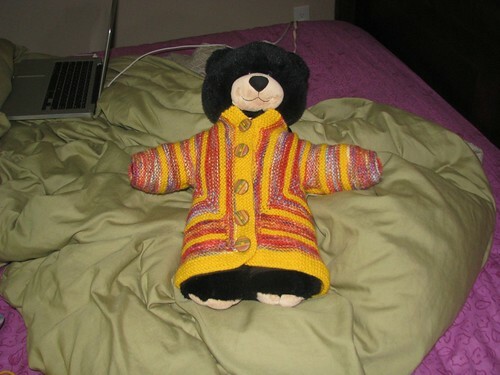 If Bear can be this cute in the sweater, imagine how adorable it will be when it actually gets wrapped around a baby.